This press release was issued today, following our post yesterday on the HMRC's publication on the 50p tax rate. LEAP has raised several serious questions about the dossier used by Chancellor George Osborne to justify cutting the 50% tax rate at the Budget last week. The dossier, published by HM Revenue & Customs (HMRC) ‘The Exchequer effect of the 50 per cent additional rate of income tax’ was published on Budget Day, and makes the case for the 50% tax rate to be scrapped and replaced with the 45% rate. Today (26 March) is the last day of the post-Budget debate, culminating in a vote on the Budget. LEAP Chair John McDonnell will be raising this issue in Parliament, which has led to a tax cut for the highest 1% of earners at a time of austerity. LEAP’s analysis raises questions about a numbers of issues, including: political interference in drafting the dossier; the efforts made by HMRC in maximising compliance with the 50% rate; and why HMRC based its assumptions on different Taxable Income Elasticity measures in 2009 when the tax was announced. "There are serious questions to be answered by George Osborne about the political impartiality of this document, in light of the analysis by LEAP – which raises massive doubts about the conclusion that the 50% rate will raise only an additional £100m. "I will be raising this issue in Parliament because it is of deep significance to the both the justice of our taxation system, and to the integrity of the civil service." "This dodgy dossier is deeply flawed in its analysis of the tax avoidance associated with the 50p rate. Its politically convenient and economically dubious conclusions seem more like the work of political placemen than politically neutral civil servants. There are several questions that need to be answered if taxpayers are to have any faith in the tax system. "Osborne claimed that the 50% tax was bad for Britain’s competitiveness, yet in the Budget debate he justified cutting it by claiming other measures would raise five times as much from the same group. The Chancellor is spinning both ways, but we need to get to the truth." According to George Osborne his budget will ensure the richest will pay five times more tax through a cap on reliefs, taxes on high end property transactions and presumed better behaviour. All of these revenues are highly variable year to year, unlike the minimum annual sum £10,000 Osborne has gifted to the highest earners by cutting the 50p rate. This is unlikely to be fiscally neutral as he claims. But in any case, the half a billion Osborne thinks these measures would raise is derisory, and as such, a sign of his clear approval of those economy-wrecking Masters of the Universe in the world of financial services who are mostly keeping their telephone number salaries and pensions, unlike those who serve us in the public sector. The ONS shows gross property wealth in 2010 amounted to 4.35 trillion. Much of this value is actually land - or location - value. Yet Stamp Duty, Business Rates and Council tax barely touch this and these charges fall disproportionately on the least well off. Properties in the highest banding for Council Tax for example, are charged only three times more those in the lowest. Property owners and property speculators will always say a silent thank you to taxpayers for the underlying and uplift in the value of the land they own when projects such as Crossrail are announced and then created. Property prices in London and parts of the South can be as much as two thirds land value or even more, as a result. "It is unfair that workers wages are taxed, pensions are taxed, business is taxed, goods and services are taxed but land wealth is not taxed. "By reforming property taxes and shifting taxes from wages and production onto land and other natural resources (including oil, airwaves and airport landing slots) we could reverse the current economic decline and relieve those unfairly bearing the brunt of austerity. "The wealth that arises from our collective use of these resources should be reclaimed for investment in our public services. This is far fairer than the current system that lets this unearned income to accrue to those who didn’t create it. "Applying an Annual Land Value Tax on land and other natural resources, will allow new businesses to be able to afford to set up all over the UK as marginal costs to businesses will be reduced and workers are left with more to spend." In his Budget statement, Osborne gave corporate Britain another cash giveaway: taking corporation tax down from 26% to 24% from next month, and committing in his statement to reduce it further to 22%, with the aspiration of reducing corporation tax to 20%. "So that by 2014, Britain will have a 22% rate of corporation tax ... And a rate that puts our country within sight of a 20% rate of business tax that would align basic rate income tax, the small companies rate and the corporation tax rate." This largesse to big business will cost the Exchequer an extra £3.76bn in the period covered by the spending review. This is on top of the £25bn in tax breaks for business announced in 2010 which included Osborne's commitment to cut corporation tax from 28% to 24% over four years. Now Osborne will cut taxes for big business from 28% to 22% over the same period. It is not as if the previous government had been loading the tax burden on business either. Under the New Labour government, corporation tax fell from 33% to 28% - costing the Exchequer £50bn in foregone revenues over 13 years (as LEAP previously estimated). So more like ... Ireland? (well, yes as the table above shows, via OECD in 2011) And by coincidence that is a country that Osborne deeply admires. It was Osborne who said in 2006, "Ireland stands as a shining example of the art of the possible in long-term economic policymaking". Ireland has been through an even more adverse austerity shock doctrine than Britain, and today slipped back into recession. Slashing corporation tax - Osborne's Irish solution - simply undercuts the tax base and hinders recovery. But it does something else - it redistributes wealth. Lower corporation tax means larger net profits, so instead these larger profits go to large shareholders in dividends and directors in bonuses. And instead of corporation tax, other taxes have to make up the void and/or public spending is cut. On the latter that has - as the IFS has shown (slide 4 here) - disproportionately hit the poorest: cutting benefits and tax credits. The other part of this equation is the effect on the tax base (details can be found in OBR data published yesterday). So while taxes from earnings rise sharply (and the regressive NI more sharply) and rise steeply for consumption (regressive VAT), taxation on profits falls as a proportion of the tax base, and relative to other taxation. So whereas in 2010/11 corporation tax accounted for 8.13% of total tax take, by 2016/17 that figure will have fallen to just 7.02%. By contrast VAT will have risen from 16.32% in 2010/11 to 17.25% in 2016/17. The Budget speech is pure parliamentary pantomime, but even that was undermined this year by the numerous (and mostly accurate) leaks beforehand. One surprise came before the budget, when February borrowing figures were published and shown to be far higher than expected at £15.2bn. This meant that there would be no net giveaways in the Budget, and reinforces what we have said throughout: if you really want to tackle the deficit you need to get people working (off benefits, paying tax) and spending (VAT revenues) + deficit closes. Even John Cridland, CBI chief, was on Radio 4 this morning conceding the real problem in the UK economy is lack of demand. "I am today publishing analysis that shows that if in the next Spending Review we maintain the same rate of reductions in departmental spending as we have done in this review, we would need to make savings in welfare of £10 billion by 2016"
"The Government will be examining the cost drivers for all areas of public spending, and identifying the further reforms needed to deliver a sustainable welfare system and public services within the resources available." 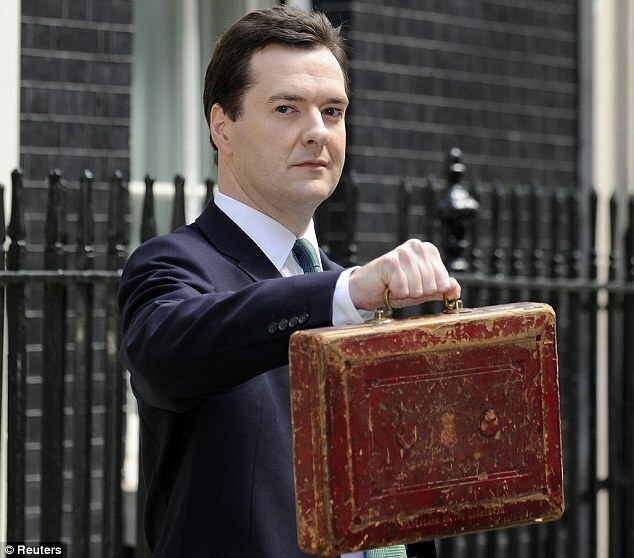 Of course the major reform that Osborne could pursue would be to create jobs. The OBR projections show even by 2016 unemployment will still be above 2 million. But what this unspecified £10.5bn shows is that Osborne's economic policies are failing, and - although his sums don't add up - he has already decided those with least should pay for it. If the 'dodgy dossier' of the Blair government was Alistair Campbell's sexed-up Iraq work of fiction, then this government's own will be this gem from HMRC. All the same questions need to be asked because it looks less like the work of an impartial civil servant and more the work of a Tory researcher, without much in the way of analytical skill or economic nous. It's major crime is to say it hasn't raised much (and less than predicted), only £1bn. A figure Vince Cable dismissed as not much. Of course that was hindered by £16bn of income shifting - highly paid people bringing forward their pay, bonuses, etc to avoid getting hit for 50% when it came in. In future years, such income shifting is impossible, and the amounts raised would be much higher - the Treasury document seems to think over £3bn per year. The dodgy dossier talks long and gibberishly about the laffer curve (see our take here) and makes some very spurious conclusions that people avoid a 50% rate at £150,000, but not a 45% rate. Go figure!? Finally of course is the brass neck with which Osborne, Cameron et al claim their stamp duty reforms will raise five times as much from the rich. Of course there'll be neither avoidance on any of that nor any behavioural changes as a result of these new taxes on selling homes worth £2m or more. But what is most dishonest in some ways is the contradiction between Osborne's bluster against tax evasion and avoidance - "I regard tax evasion and – indeed – aggressive tax avoidance – as morally repugnant" - and the fact that in the face of large scale (though largely temporary) avoidance of the 50p rate, he has decided to reduce it. Thankfully though, HMRC tells us, it will only cost us £100m per year. Of course if they have got that wrong (and they have) then we can expect more cuts or more borrowing. I use the twitter-defined name as a shorthand, but Osborne has done is to freeze age-related allowances - the amount of income over-65s can earn tax-free - for existing pensioners, and scrap the relief for those retiring after April 2013. This will cost millions of mid-income pensioners about £250-300 per year. It is a stealth tax on pensioners, and come May will probably prove as electorally misguided as Gordon Brown's 75p increase in the basic state pension over a decade ago. The extra dishonesty factor about this is two-fold: 1) it was the only major item in the Budget not trailed in advance; and 2) Osborne announced it in his statement by saying "we will simplify the tax system for pensioners by doing away with the complexity of the additional age-related allowances". Alongside the Budget, Osborne published the 'distributional analysis' to show the effects of the changes he has made on people's incomes (Annex B of the Budget red book). What it does not include is the cutting of the 50p top tax rate to 45p - which would save someone like Bob Diamond at Barclays over £300,000 per year - as apparently "presenting a static analysis would not be representative of likely actual impacts". What is also necessarily excluded from this analysis is the yet-to-be-specified but committed to £10.5bn extra welfare cuts which will disproportionately hit the lowest income deciles. So what we see is an analysis that omits both the big tax break for the rich, and the future hammering of the poor. Convenient. The pension age will rise beyond 68: "I can confirm today that there will be an automatic review of the state pension age to ensure it keeps pace with increases in longevity". The problem with this is that increasing longevity is highly unequal, i.e. the richer are increasing their life expectancy at a quicker rate than the poorest. This is doubly bad news since poorer people also cannot afford to retire early, so their retirement gets squeezed, while the rich live for longer in retirement. Hugo Radice outlines the implications of the European Central Banks' recent actions to support the European Union's banking sector. Through the second half of 2011 there were persistent signs of financial stress in many banks right across Europe – not only in Greece, Ireland, Portugal, Spain and Italy, but in France and even Germany too. The banks were already struggling to meet the higher capital and reserve requirements that have been emanating from the Basel III international regulatory proposals, as well as to meet public expectations of a resumption in lending to help the economic recovery. But in addition, the continuing uncertainties about Eurozone sovereign debt led to a seizing-up of the interbank loan market, and the supply of term deposits and medium-term lending to banks, on a scale not seen since the 2007-8 credit crunch. However, the unexpected and massive loan interventions by the European Central Bank in December and February appear to have completely transformed the picture. The new head of the ECB, Mario Draghi, invited all Eurozone banks to apply for unlimited loans at 1% interest and up to 3 years’ duration, and has thereby pumped over €1 trillion of liquidity into the banking system. The loans under the Long-Term Refinancing Operation (LTRO) were made available to all banks operating within the Eurozone, not just those owned and headquartered in the zone, so even UK banks have been able to borrow, albeit only within their Eurozone subsidiaries. The total amount lent was €489 billion in December, and a further €530 billion on February 29th. This move by the ECB took most commentators by surprise. Their attention was focused firmly on the sovereign debt problems, and when Draghi took office he made it quite clear that he was not about to take up the proposals by Keynesian critics of austerity for the ECB to directly support the sovereign debt market by large-scale bond purchases, or to consider the pooling of risk by means of exchanging national sovereign debt for ‘Eurobonds’. Given the continuing failure of Europe’s political leaders to resolve the marathon Greek crisis and reassure the bond markets over the risk of contagion, it was politically impossible for Draghi to openly challenge the dominant views of Eurozone creditor countries, who were adamantly opposed to such a resolution. So what is the significance of this new ECB policy? First, the ECB has provided significant breathing space for European banks, given their need to refinance their loan books, build up their reserves and increase net lending to help the recovery. Second, the banks have used some of their new borrowing from the ECB to buy Eurozone sovereign debt, easing the pressure on national governments. Thirdly, it has brought a political breathing space while the Eurozone’s national governments try to reach agreement on the long-term objectives of a de facto fiscal compact and a new European Stability Mechanism. With regard to the banks themselves, in the run-up to the December loans it was increasingly clear that a major source of worry for Eurobanks was the drying-up of lending from US money-market funds – a major component in the so-called ‘shadow banking system’ in the USA. Such lending had funded a large proportion of Eurobank purchases of US asset-backed securities during the run-up to the 2007-8 credit crunch, and many of those loans were due for repayment in 2011-12. As the Eurozone debt crisis dragged on through 2011, the US funds cut back their exposure to both sovereign debt and European banks, reducing such lending from 30% of their assets to around 10%. But since December, they have begun once again to lend to European banks: this indicated their need to find profitable use for their mountains of cash, their increasing confidence that the US and global economies would avoid a double-dip recession, and their view that the Eurozone would at least muddle through the sovereign debt crisis. Nevertheless, this return to borrowing from US money market funds carries significant risks, in the view of Eurozone financial authorities, precisely because they don’t want the banks to rely on short-term borrowing. Instead, they hope that the general easing of what was shaping up to be a severe credit crunch will allow banks to raise much longer-term finance to enable them to meet the Basel III capital requirements and go on to finance a European recovery. In relation to the sovereign debt crisis, while the cost of borrowing has fallen significantly, it is not clear how far this has been directly the result of the LTRO. Historians of the crisis will recall that in 2009, when the US Federal Reserve and the Bank of England embarked on their policies of quantitative easing (QE), the ECB instead, as The Economist put it, “offered unlimited loans to commercial banks for up to a year against a broad range of collateral”. The result was much the same as that of QE in the USA and UK: “Banks used much of the cash to buy government bonds, which drove down long-term interest rates”. What is more, the ECB has discreetly helped to manage the sovereign debt crisis in another fashion: through its role as a clearing-house for the settlement of intra-Eurozone foreign trade, a system known as Target2. By December 2011, the German Bundesbank was in credit with Target2 to the tune of €495 billion, which in practice means that Germany has lent this sum to the Eurozone trade deficit countries, especially Greece, Ireland and Portugal. By giving help in this discreet way, the ECB has in effect protected Chancellor Merkel and the Bundesbank from the wrath of German public opinion. In any case, since December 2011, Italian and Spanish banks have bought their own governments’ debt, but it is hard to separate out this factor from the generalised support that the bond markets have shown following the accession to power of first Mario Monti and his ‘government of technocrats’ in Italy, and more recently the Partido Popular under Mariano Rajoy in Spain. Whether the bond markets will remain supportive will depend on their economic and political expectations through the rest of this year. The announcement on March 8th that Greece’s private creditors have accepted their ‘haircut’ may turn out to be another flash in the pan, if the Greek economy continues its precipitous decline under the weight of austerity. And this brings us to the broader question of the future of the Eurozone, and indeed the EU as a whole. At present it looks as though the trumpeted December agreement on a fiscal compact will be ratified by those national governments that signed up to it, although the process could be delayed or even derailed, if the Irish government finds itself obliged to hold a referendum. At the same time, businesses, households and investment institutions are sitting on huge mountains of cash, which are not going to be spent unless and until ‘confidence’ is substantially restored. Right now, while there are continuing signs of some economic recovery in North America, Europe as a whole is at best stagnating, while China and other so-called emerging economies are experiencing a slowdown. The prospect of accelerating public spending cuts, especially across nearly all of Europe, is increasingly troubling not just Keynesian converts like Martin Wolf of the Financial Times, but also those bastions of neoliberalism, the International Monetary Fund and the Organisation for Economic Cooperation and Development. However, we should not forget the old maxim “never waste a good crisis”. The media debate over the Eurozone has viewed the political drama of summits and compacts very largely in terms of the issue of national sovereignty and EU governance, which has dogged the entire European ‘project’ ever since 1958. But the underlying story which needs to be brought into the spotlight is the way this sovereign debt crisis is being used to accelerate the implementation of neoliberalism across the EU and beyond. In this respect, market liberalisation and deregulation may be just as important as fiscal and monetary policy. To a considerable degree, Germany’s relative economic success since 2000 is not because of superior management, high technology and ‘patient’ bank finance, but the Hartz series of labour market reforms. These have had two particularly important consequences: first, they led to the creation of several million mostly part-time and ‘flexible’ jobs, which has reduced the headline rate of unemployment; and second, taken together with the relentless campaign of the mainstream parties (especially the SPD) and the media, the penetration of the ideology of competitiveness into the more privileged full-time workforce. This was reinforced in 2008-10 by government initiatives to support the adoption of shorter working hours, as an alternative to layoffs that would disperse job skills and demotivate the workforce. The German ‘success story’ has now become the European equivalent of the Washington Consensus, through which neoliberalism was imposed across the less developed world in the 1980s and 1990s. In the Euro-periphery, flexible labour markets, deregulation of the professions and the privatisation of the public sector have formed the core of the ‘reform’ programmes in Spain, Italy and Portugal, as well as most notoriously Greece. Ireland already had an exemplary neoliberal political economy before the crisis, although this does not appear to have spared them any of the rigours of austerity. These programmes are presented as absolutely necessary to restore national competitiveness through reducing costs of production; it appears to have escaped most liberal commentators that if all countries pursue this strategy, they will end up on a downward spiral of reduced incomes and lower consumption, together with a system-wide redistribution of income from wages to profits. Although having no direct role in its implementation, the ECB has nevertheless played a vital role in disseminating the ideology of market liberalisation and national competitiveness, revealed recently in Le Monde Diplomatique. Presenting itself as ‘apolitical and run by technicians’, the ECB is now busy transferring this mantra to the new governments under its de facto control in Greece and Italy. Governments elsewhere in Europe, regardless of their supposed political colour, are using the Bank as cover for their uniform policies of austerity and liberalisation. Furthermore, the resumption of neoliberal ‘business as usual’ has the support of the great majority of ‘mainstream’ economists, many of whom have now been ‘outed’ as the paid servants of private finance and big business. But in addition, the ECB’s LTRO provides a loan period of three years, not the one year period offered in 2009. Unless the Eurozone’s plans for a fiscal compact and a larger stability fund come seriously unstuck in the meantime, this has the important consequence of providing a breathing space to implement the revamped neoliberal model more fully. Twenty years ago, the European centre-left actively pursued the alternative ‘social Europe’ model, but signally failed to convince the European public sufficiently to head off the neoliberal juggernaut. This time round, we somehow have to do better; otherwise we face not just years of austerity, but the final dissolution of the postwar welfare state in Europe. The banks have got it made. They have ripped off people with exorbitant charges and measly returns on savings. They have picked people’s pockets with the mis-selling of payment protection insurance, endowment mortgages, personal pensions, precipice bonds and split capital investment trusts – to name just a few. Banks have driven up the price of food and commodities through speculation, a major cause of commodity inflation. The state has guaranteed their profits through the Private Finance Initiative and the channelling of pensions and benefit payments through bank accounts. The taxpayer has bailed out banks through loans, subsidies and guarantees that add up to more than £1 trillion. Yet, in return, the banks cannot be relied on to pay democratically agreed taxes. Barclays Bank is the latest example of the unacceptable entrepreneurial culture where bending the rules to avoid taxes and boost corporate profits is considered to be a skill. In 2009, Barclays paid £113 million in corporation tax to the United Kingdom – about 2.4 per cent of its £4.6 billion global annual profit. Now the British Government has announced that Barclays tried to avoid £500 million of tax through two novel schemes. The first was designed to ensure that the profit arising to the bank from a buy-back of its own debt is not subject to corporation tax. The second bit of alchemy was a scheme to convert non-taxable income into an amount carrying a repayable tax credit in an attempt to secure “repayment” from the Exchequer of tax that has not actually been paid. The £500 million that Barclays sought to avoid is equivalent to the cost of 100 new primary schools, or employing 16,000 nurses. Yet Barclays and its tax advisors were not bothered about the social consequences. The bank’s defence was that other corporations are also doing the same and it has not broken any laws. Each year, Barclays publishes what it calls a Citizenship Report and claims that it is a socially responsible organisation. In 2008, soon after the banking crash, Barclays’ chief executive Bob Diamond publicly said that, in future, banks would be good citizens. In November 2010, major banks, including Barclays, signed the Government’s Code of Practice on Taxation and promised that “that banking groups, their subsidiaries, and their branches operating in the UK, will comply with the spirit, as well as the letter, of tax law” and “not undertake tax planning that aims to achieve a tax result that is contrary to the intentions of Parliament”. All the promises have been broken and show the folly of relying on voluntary codes. The Government will collect the £500 million in tax, but there are no penalties for violating the Code of Practice, which was lauded by Prime Minister David Cameron as a step towards “responsible capitalism”. Barclays is no stranger to controversy. Last year, the World Development Movement estimated that Barclays generates a profit of around £340 million a year through food speculative activities, a major cause of hunger around the world. Barclays and 15 other banks are being investigated by the European Commission to ascertain whether they have colluded and/or may hold and abuse a dominant position in order to control the financial information relating to credit default swaps, which are complex financial instruments used to manage risks. In April 2011, Liberal peer Lord Oakshott urged the government to investigate Barclays over the $12.3 billion (£7.4 billion) sale of toxic assets to a Cayman Islands company. The company was called Protium and was founded with a $12.6 billion loan from the bank. The deal had the potential to enable Barclays to avoid millions in taxes and a headline in the Daily Telegraph screamed ”Barclays’ Protium deal is all that’s wrong in the City”. Barclays is thought to have 174 subsidiaries and ventures registered in the Caymans, a place that does not levy any corporation tax and is known for lax regulation. The extent of speculative and tax avoidance activity routed through tax havens is not known. Barclays and other multinational corporations indulge in tax avoidance for two main reasons. First, stock markets exert incessant pressures on corporations to report higher profits. Rather than competition, innovation, investment, better services to customers and communities, many companies find it easier to boost profits through tax avoidance. Second, this suits executives as their remuneration is linked to profits. Barclays’ chief executive Bob Diamond has been receiving mega-bucks in salary and bonuses, but there is silence on the extent to which they are financed by tax avoidance. Tax avoidance enriches few and impoverishes many, but banks do not publish any meaningful information about their indulgence in tax avoidance. The annual accounts do not provide any indication of the profits boosted by tax avoidance schemes. Neither do they provide any information about the sales, profits, employees and taxes for each country of their operations. Such information would show that subsidiaries in tax havens do little trading, have skeletal staff but somehow report huge profits, or that large amounts of revenues are generated in the Britain, but corporate taxes are avoided. This information would help to focus attention on the artificial shifting of profits, but successive governments have done nothing to create this transparency. Organised tax avoidance affects us all. Democracy, responsibility and accountability should be mobilised to check it. All corporate tax returns and related correspondence should be publicly available so that we can all check corporate claims of social responsibility and good citizenship. The threat of public sunlight has the potential to check selfish impulses. At the moment, there are no personal consequences for directors indulging in complex tax avoidance schemes or for accountants crafting complex avoidance schemes. Many of the avoidance schemes have been declared to be abusive by the courts, but still there is no retribution against directors and accountants. The lack of penalties has created a gaming culture which drains the public purse. Legislation should be enacted to make directors and designers of abusive avoidance schemes personally liable for up to 10 times the amount of tax involved. The prospect of personal costs would provide some food for thought. One of the aims of a Mansion Tax is to collect a share of the untaxed wealth the rich currently enjoy. However, its advocates fail to recognise why very expensive properties are so expensive: it is the location of a building that creates high property prices not the building itself. Advocates of a Mansion Tax also fail to realise that many of the owners it aims to tax in this way will avoid paying it once introduced. It doesn’t take much nous to predict that overnight a £2.3million home would suddenly only be priced at £1.9million but with the contents priced at £.4million. Vince Cable apparently fails to recognise what gives a property its value – the building value and the location value. The building value will always deteriorate as happens with all second-hand goods. However, the location value of any property (commercial or residential) is due to society’s overall demand to be located in that area. That demand is determined by a site’s accessibility to public transport, roads, schools, hospitals, other health care, leisure facilities, natural beauty, shops, employment/workforce etc. Eleanor Firman, Chair of the Labour Land Campaign (www.labourland.org) says “It is society’s combined public and private investment that generates land values – not the owners of land who can - and do - leave land idle and still see it rise in value without lifting a finger. The Morning Star also covers this issues and covers the publication of the TUC's new report Is 50/50 fair? which looks at the 50p tax rate. According to the TUC the Treasury could raise more than the £3 billion it originally forecast from the 50p rate if it tackled tax avoidance. Mr Barber added that calls to scrap the 50p tax are about the richest 1 per cent trying to dodge paying their fair share of tax and making everyone else pay more instead. Left Economics Advisory Panel co-ordinator Andrew Fisher stated that lowering the 50p tax to earners on £100,000 and putting a 60p rate on those on £150,000 would be fairer. He said: "We now need a real debate throughout the labour movement on fair taxation, to include new wealth and land value taxes, as well as reducing regressive taxation like VAT."